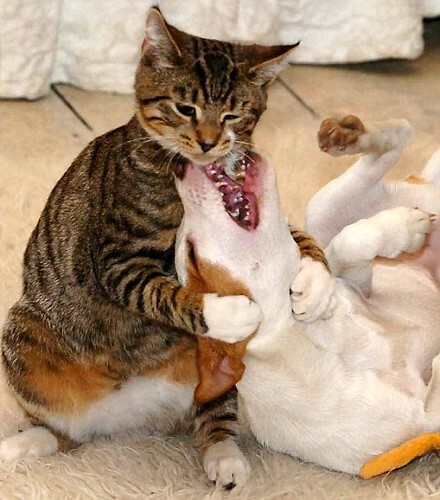 Cat Meets Dog….Can’t we all just…get a room? 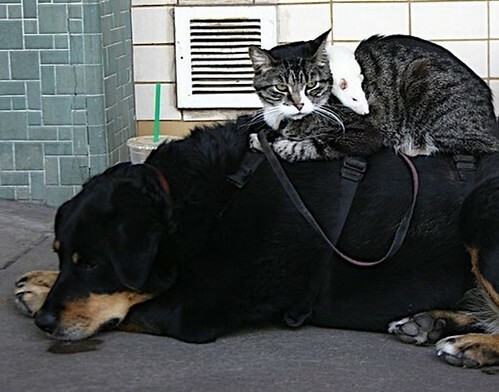 In all my years of working with cats in a shelter environment, perhaps the most popular question asked is; “Can you help me find a cat that will get along with my dog?” As simple as this question may appear to be, it’s a huge math equation that requires a predictive approach to finding the answer. It involves a little guess work, prior knowledge about the independence and gregariousness of the cat and also some background on the resident dog. To put it frankly, it’s very hard to answer without thumbing through an entire list of animals and trying to imagine them adapting to a specific situation or enviroment. So, to make things simpler for all of you, I have compiled some tips to help you out with the search for the ultimate dog-friendly-feline. 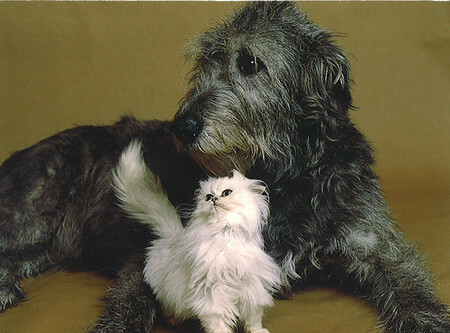 The best predictor of how cats and dogs will get along together is their background. Have you walked past a cat with your dog? Did it growl, bark or lunge, or did it just get curious or not care? Audition your dog on leash with a willing cat that already has dog experience – they are less likely to run away and pee on your brand new Ikea sofa. It’s also good to try out the same cat on more than one occasion and to try out more than one cat. The trick will be finding this brave and un-frazzled feline. Some cats, or shall I say most cats …will want nothing to do with this experiment. Read up on the cats past history. If you are adopting from a shelter, ask the adoption staff to dig up any information on the cats prior experiences. This will be essential in trying to imagine how it will be effected by a dogs approach, play and general cohabitation. Be aware that certain dog breeds are hard wired to chase small prey. A feisty terrier that digs holes in your yard and brings home dead critters may not be a good companion for a 2 month old kitten. Predatory types are much more stressful for cats and must be constantly managed when around the cat if they are to live with one. Predation is not something a dog can be easily trained not to do as it is deeply ingrained. 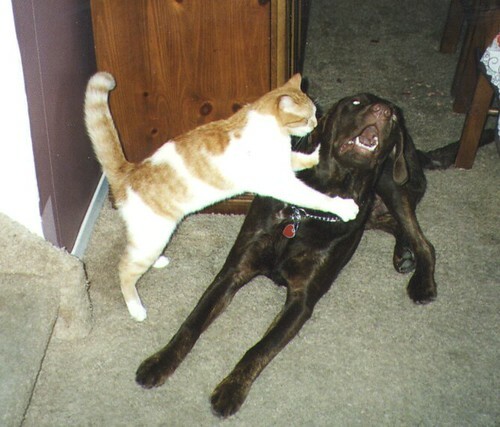 Cats who have not been socialized to dogs will almost always behave defensively, by fleeing and/or with an aggressive display the first time they encounter a new dog. 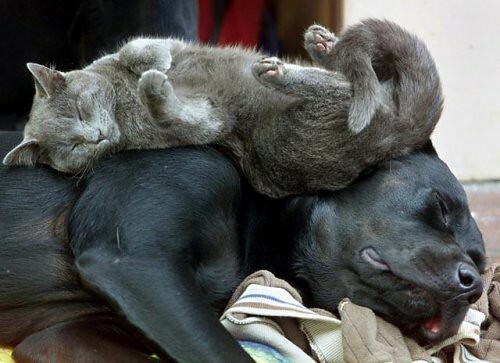 If the dog does not come on too strong, and if the cat is given dog-free zones to retreat to, many cats will gradually get used to the dog and sometimes even become bonded. Ok, So you did it. 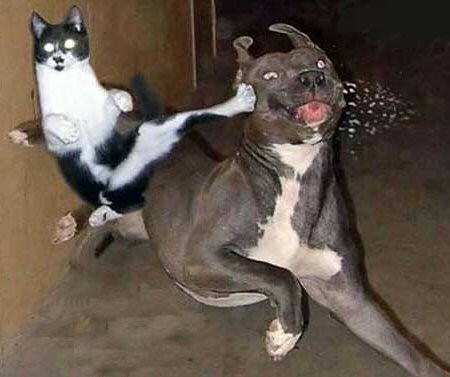 You combined a cat and a dog. What should you do to make your home more appealing to both? Have a “safety room” or rooms as well as high places the cat can access but the dog cannot. 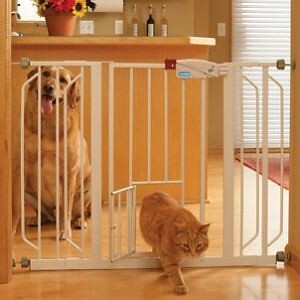 Baby-gates, cat doors and clearing high surfaces can accomplish this. It is important that the cat can retreat to regroup and relax away from the dog and then venture forward into “dog territory” at her own pace. The cat should have access to food, water and litter in this area so no interactions with the dog are forced. 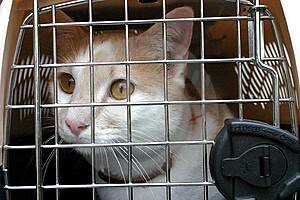 Never force the cat (or dog) into proximity by holding them, caging them or otherwise restricting them from escaping. This is defintely not going to help matters. Aside from it being inhumane, stress is a common reason for cats to break litter box training and nobody wants that! For the first introduction, have the dog on leash in case he decides to chase. If it seems to be going well, take the leash off and supervise closely. If the dog is behaving in a friendly and/or cautious way, try to not intervene in their interactions, except to praise and reward the dog for his good manners. Interrupt any intense chasing and try to redirect the dog’s attention to another activity – this is very difficult so you may be forced in future to manage the dog on-leash around the cat until you have worked out a routine or divided up the house. In the first few weeks, observe the trend: are things getting better or worse? Monitor interactions until there is a pattern or plateau in their relationship. If the dog is the newcomer, be sure to give plenty of extra attention to the cat so she does not associate this change with reduced attention and affection. If the newcomer is a cat, it’s also a good idea to make sure the dog associates the new intruder with good things for him. Shoot for positive associations always. 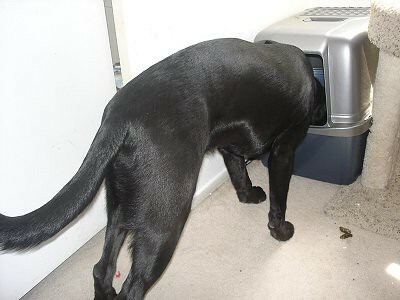 Dogs should not have access to the cat litterbox – it is too stressful for the cat and the dog may eat cat feces and litter. Most dogs will also eat cat food the cat leaves behind – we suggest feeding cats in the cat’s “safe” room or on a high surface. >;If you are successful with getting the dog and cat to live in harmony, perhaps you want to try adding a rat for good measure? P.S. 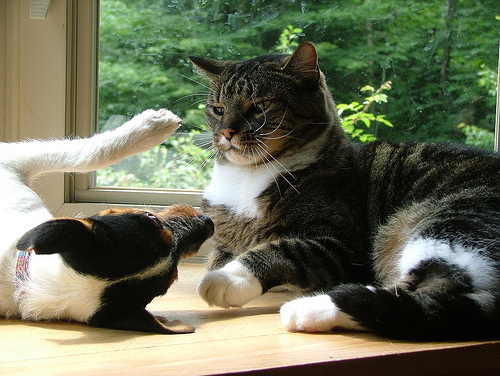 I purposely chose pictures for this blog where the cat had the upper hand over the dog. No offense to you dog folks.